Keratitis is an inflammation in the cornea. 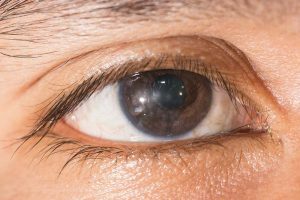 This relatively common condition can either be infectious or non-infectious, and superficial or stromal (affecting the deeper part of the cornea). The cornea is the dome-shaped clear lens that covers the iris and the pupil. Corneas have a part to play in focusing light, and issues with the cornea can affect your vision. For this reason, it’s important that Keratitis is promptly diagnosed and treated. Each year, around 50,000 Americans are diagnosed with Keratitis. The condition can affect people of all ages. Here, we answer some of the most commonly asked questions about Keratitis. We also go over the causes of the condition, along with some information on the different types of Keratitis, the risk factors, the signs and symptoms, and the treatment options. The exact cause of Keratitis is dictated by whether the inflammation is infectious or non-infectious. Let’s take a closer look at the different types of the condition below. Infectious Keratitis, either acute or chronic, is caused by an infectious agent of some kind. Infectious agents include bacteria, fungi, and viruses. Staphylococci, Haemophilus, Streptococci, and Pseudomonas bacteria are the most common causes of bacterial infectious Keratitis. The viruses most likely to cause Keratitis are adenoviruses, herpes simplex, and herpes zoster. Herpes simplex is the same virus which is responsible for cold sores, for this reason, those who do get cold sores are slightly more likely to develop viral Keratitis. Candida, Aspergillus, and Nocardia are the fungi most commonly responsible for fungal infections of the cornea. Lens wearers are more likely to develop Keratitis than those who do not wear contact lenses. Because of this, if you wear contact lenses make sure that you always wash your hands before putting in or taking out your lenses. You should also make sure that your lenses are properly cleaned and that you do not wear them for longer than your optometrist has recommended. The use of corticosteroid eye drops may make you more likely to develop Keratitis. For this reason, use your prescribed medicated steroid eye drops exactly as prescribed by your eye doctor or GP. If you have an immune system disease or are undergoing chemotherapy, there is an increased risk of developing Keratitis. This last risk factor is purely an environmental one. If you live in a place where the climate is hot and humid on a regular basis, you’re at a slightly higher risk for developing Keratitis. Keratitis is not normally considered a serious condition so long as a prompt diagnosis is made and a treatment plan put in place. That said, it can certainly feel serious enough to those who suffer from Keratitis, particularly if the condition is chronic (recurring even after treatment). If, however, Keratitis remains untreated some serious complications may arise. The condition may also change from being superficial (on the surface of the cornea) to affecting the deeper part of the cornea. Chronic Keratitis – The condition responds to treatment but then recurs repetitively. Corneal perforation – Corneal perforation occurs when severe Keratitis leads to a small rip or tear in the cornea. This is normally treated with surgery. Corneal scarring – If Keratitis affects the deeper part of the cornea there is an increased risk of scarring. As scars are permanent, this may mean decreased vision in the affected eye. Can Keratitis lead to blindness? Yes, but only in the most serious of cases, and/or in cases that have gone wholly untreated. Around the world, Keratitis as a result of the herpes simplex virus (HSV) is a leading cause of blindness. In developed nations, such as the United States, there are far fewer cases of HSV causing blindness. Because there is the potential for permanent and irreversible damage to your vision, all cases of Keratitis should be diagnosed by an eye specialist and treated immediately. The treatment for Keratitis varies depending on whether the type of the condition is infectious or non-infectious. Most often, the treatment for Keratitis is eye drops. In some cases, oral medications may also be prescribed. In the case of a cornel perforation, a surgery may be needed to repair the rip or tear. In very severe cases, a corneal transplant may be performed. Yes, most cases of Keratitis can be cured fully so long as treatment is sought. If a prompt treatment plan is not put in place then deep scarring may occur which can require surgical intervention to fix. If you suspect that you may have Keratitis, please make an appointment or walk in to see us here at The New Jersey Eye Center, in Bergenfield, NJ. Our experienced eye specialists and nurses have vast experience with Keratitis, both infectious and non-infectious. Avoid permanent damage or surgical intervention by making sure that Keratitis is diagnosed and treated promptly. Short Description: Keratitis is an inflammation in the cornea. This relatively common condition can either be infectious or non-infectious, and superficial or stromal (affecting the deeper part of the cornea). The cornea is the dome-shaped clear lens that covers the iris and the pupil. Corneas have a part to play in focusing light, and issues with the cornea can affect your vision. For this reason, it’s important that Keratitis is promptly diagnosed and treated. Each year, around 50,000 Americans are diagnosed with Keratitis. The condition can affect people of all ages.